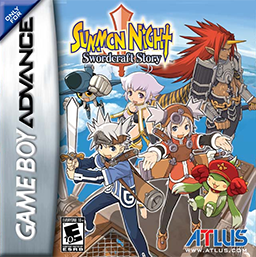 Summon Night: Swordcraft Story is part of the Summon Night game series, an action RPG franchise published by Banpresto/Atlus for the Nintendo Game Boy Advance system. Summon Night: Swordcraft Story’s backstory centers on Shintesu, the Craftlord of Iron, who sacrificed his life to protect his family. The remaining Craftlords devise a competition to replace their fallen hero while the foreign nation of Deigleya has their own agenda – as well as an ancient forbidden secret. Gameplay progresses through a 10 day journey through the fictional fantasy realm of Wystern and the Labyrinth Dungeon. Throughout each day of the journey more levels are unlocked, the player completes mandatory quests, forges weapons, and each day concludes with tournaments or boss battles. The user can chose who the player spends the night with, and that choice determines a subsequent cutscene.